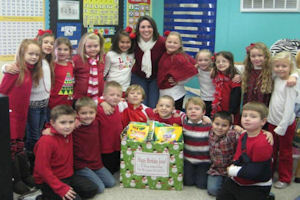 Julie Carpenter has created a new tradition in her first grade classroom at Calvary Christian School in Kentucky. 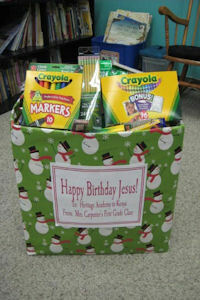 Last year, and again this year, the class celebrated Jesus’s birth by throwing a birthday party and bringing gifts in his honor—school supplies to benefit Heritage Academy! Julie shares the response and reaction she’s gotten from the children in her classroom this year. My first grade class at Calvary Christian School supports the children at Heritage Academy through prayer and donations. They pray for the children everyday, and they were excited to help them when they had the chance. For our “Happy Birthday Jesus” party, they brought in tons of school supplies for the children, and they wrote sweet letters as well. We hope the school supplies will be helpful to all of the children at the school, and we hope the letters will remind them that their friends in Kentucky love and care about them. I have two stories to share about two of the little girls in my class. I have a class website, and I post photos on it throughout the school year for the families to view. Of course, the photos from my trip to Kenya are on there because we support the school as our international class mission. Rachel’s mom told me that Rachel asks to look at the photos of the children often. She talks about them and prays for them every day. She even wants to be a missionary now and go to Kenya to help them! During our parent/teacher conference, we started talking about her passion for the children in Kenya. Her parents mentioned wanting to go on a mission trip as a family sometime. I immediately mentioned the medical teams going this summer because Rachel’s dad is an anesthesiologist, and I sent more information about VPA. Rachel’s dad made contact with the person in charge of the medical teams and they are now planning on going as a family with the medical teams in the summer of 2014! I’m so excited for their family, but I’m even more excited for Rachel! God is working out a plan so her passion to be a missionary can be nurtured even more! God is so good!!! It’s a joy to pass the passion I have for the children of Makutano to my students. God is planting seeds in the hearts of His sweet children, and they’re growing in beautiful ways. Merry Christmas!